Twitter users within the global Twitter community can be categorized according to different criteria. Based on the number of Twitter messages published and the number of followers I have identified 4 types of Twitter users. A Lurker is a Twitter user who has published only a few messages and who has a limited number of followers (people reading his Twitter messages). Everyone starts as a Lurker. A Bot is a Twitter account on which automatically generated messages are published. Such Twitter accounts can be set up to monitor website availability, to republish headlines of a news site or to indicate which songs have been recorded to name only a few examples of usage. These Twitter accounts have mostly only a limited number of followers and many many updates. An High Influential is a Twitter user who publishes only a limited number of messages and at the same time has a whole herd of followers. High Influentials don't write much, but they are read by many people. A Twitter Star publishes many messages who are read by many followers. These Twitter users tend also to have many friends. Twitterholic is a service that monitors the Twitter Public Timeline to identify the most popular Twitter users. 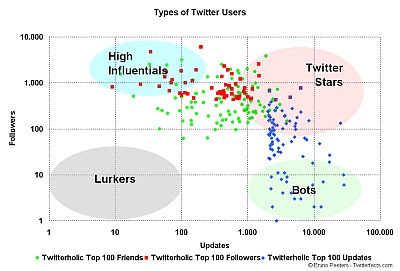 Twitterholic publishes a top 100 by number of friends, a top 100 by number of followers and a top 100 by number of updates (messages published). I have created a graph with all Twitter users in one of these 3 Twitterholic top 100 lists taking into account the number of updates and the number of followers. The graphs show clearly the relationship between number of messages published ("updates") and the number of readers ("followers"). The 4 types of Twitters users can be easily identified on the graph below. The global Twitter community (the Twitosphere) consists of many subcommunities. A subcommunity is charaterized by something the Twitter users have in a common. Good examples are the communities by country. 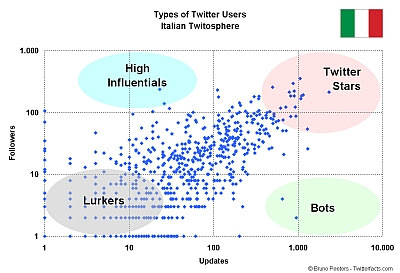 In previous posts on this blog I presented States of the Twitosphere for the Twitter communities in 4 different European countries : Belgium, the Netherlands, Italy and Spain. In order for a Twitter (sub-) community to be successful, a critical mass of High Influentials and Twitter Stars needs to be present within the community. These High Influentials and Twitter Stars will inspire a lot of followers to use the Twitter platform to exchange messages. The graphs below show the Twitter users identified in Spain, Italy and Norway. As the three graphs above use the same scales on the axes, it is easy to compare the different communities. 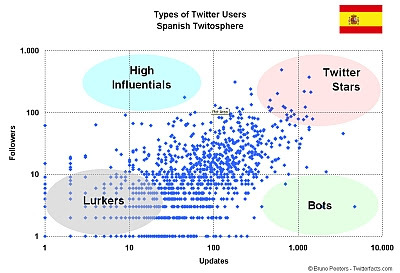 The Twitter communities in Spain and Italy seem to have a significant number of High Influentials and Twitter Stars. 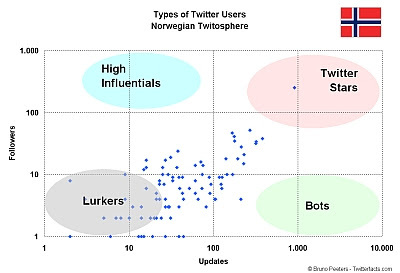 The Twitter community in Norway however consists mainly of Lurkers. There are no High Influentials and only one Twitter Star. Future will tell if within the Norwegian Twitter community a few Twitter users will become local High Influentials and Twitter Stars, so that the Norwegian Twitter community will flourish. hmmmm .... it seems to me you left out a very big component. those are the people who post a few twitters per day or week and have a few handfuls of friends. when you look at the graph, most people are in the middle of it. i suspect my stats would show up somewhere in the middle. why have names for the outliers but not for the bulk of the distribution? ok, let's name them, then. let's see, what should we call these twitterers ... (think, think, think) -- aaah! how about "normal people"? How did you pull the data for the per country graphs? Nice! Still an interesting article, thanks. Have you any updated stats avail by any chance. Pls include South Africa. I'm a "Twitterstar" ,yet I was not mentioned in your article.Perhaps that's vain or egotistical to say,but it's how I feel. I'm not a celebrity,just an average woman with little to do with her day,as well as one with a highly addictive personality.